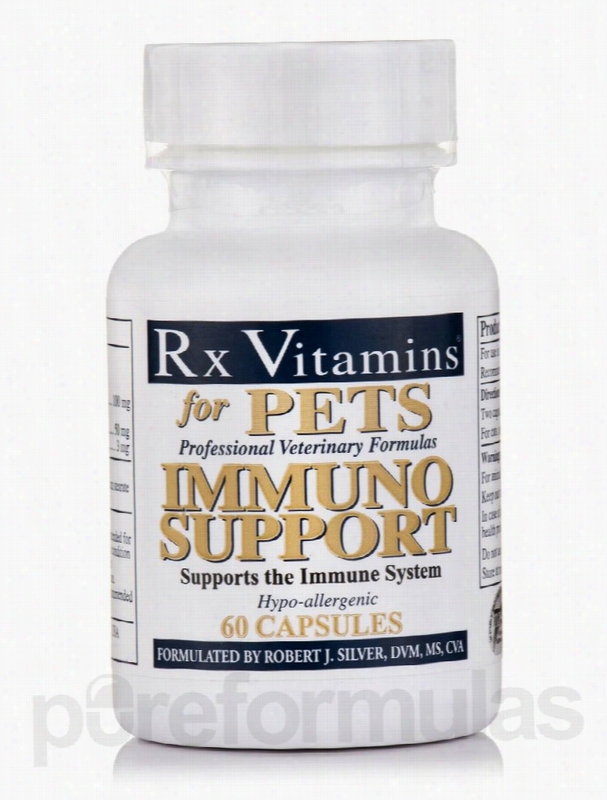 Rx Vitamins Dogs - Immuno Support for Pets - 60 Capsules. 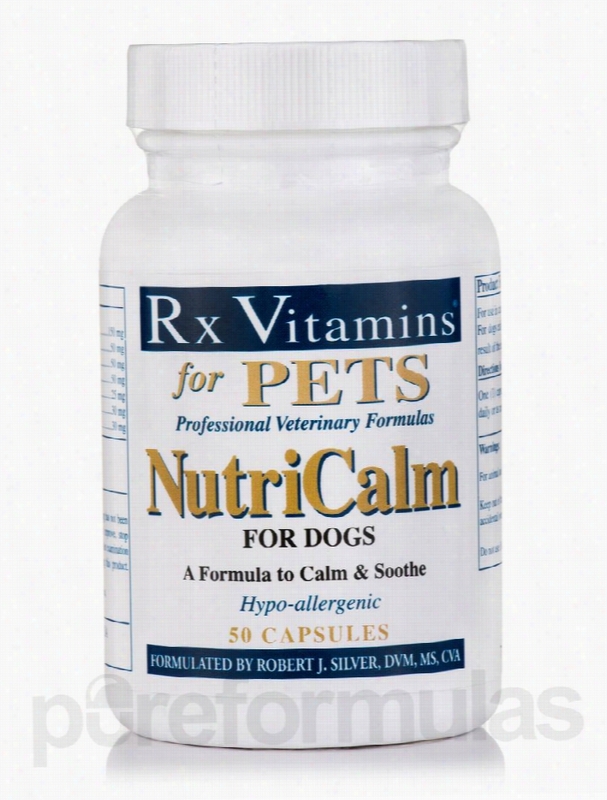 Rx Vitamins Dogs - NutriCalm for Pets (Dogs) - 50 Capsules. Rx Vitamins Dogs - NutriGest for Pets (Companion Adults) - 90 Capsules. Having a pet is great&sbquo; but it can be heartbreaking when they aren&rsquo;t feeling their best. Digestive problems are just as serious for cats and dogs as they are for human beings. Poor digestion can cause them Pain&sbquo; and it may also lead to other&sbquo; more serious problems. Since your pet&rsquo;s health is so important to you&sbquo; you want to make sure to address any digestive or bowel problems as soon as you notice them. You can give your pet a supplement to help support a healthy digestive system. 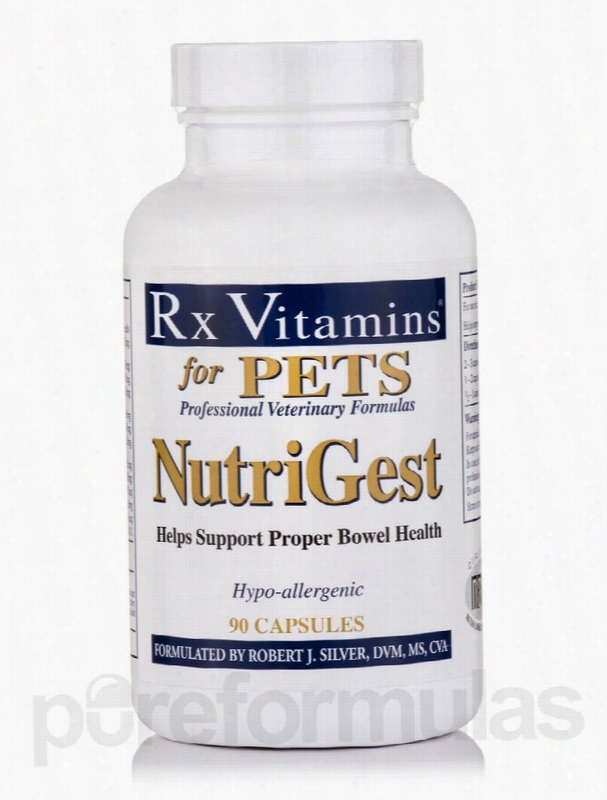 RX Vitamins&rsquo; NutriGest for Pets is a product that can help keep the feline or canine digestive system running smoothly. It works to both prevent any digestive problems and treat any existing ones. The ingredients in NutriGest for Pets are proven to help support a healthy digestive system for both cats and dogs. If your pet is having problems&sbquo;you should talk to your veterinarian about this supplement for adult pets. It can give them the relief that they need without major side effects. Some of the ingredients contained in NutriGest for Pets include: Probiotic Cultures&sbquo; which help modify intestinal microbial populations. L- Glutarnine&sbquo; which is an amino acid that is often used for digestive conditions. Cats Claw&sbquo; which is an herb that is often used to treat digestive disorders. Calcium&sbquo; which is a mineral that is used in many bodily functions. How long one bottle of 90 capsules of NutriGest for Pets (Companion Adults) will last depends on the size of your pets. Large dogs should take two to three capsules&sbquo; twice daily; medium size dogs should take one to two capsules twice daily. Finally&sbquo; small dogs and cats should take between &frac12; and one capsule&sbquo; twice daily. If necessary&sbquo; the dosage can be doubled in some cases. Since its founding&sbquo; Rx Vitamins has been dedicated to producing state-of-the-art and innovative nutraceuticals specific to each health condition. Health care practitioners have come to know Rx Vitamins as a producer of dependable&sbquo; high-quality&sbquo; effective nutritional supplements available at reasonable prices; its products are often recommended to them by fellow clinicians. Rx Vitamins has become well known as a trustworthy source of health-enhancing products that can be counted on to help both human and animal patients&sbquo; due to scientific research. These statements have not been evaluated by the Food and Drug Administration (FDA). These products are not meant to diagnoseÃ¢ÂÂ treat or cure any disease or medical condition. Please consult your doctor before starting any exercise or nutritional supplement program or before using these or any product during pregnancy or if you have a serious medical condition. 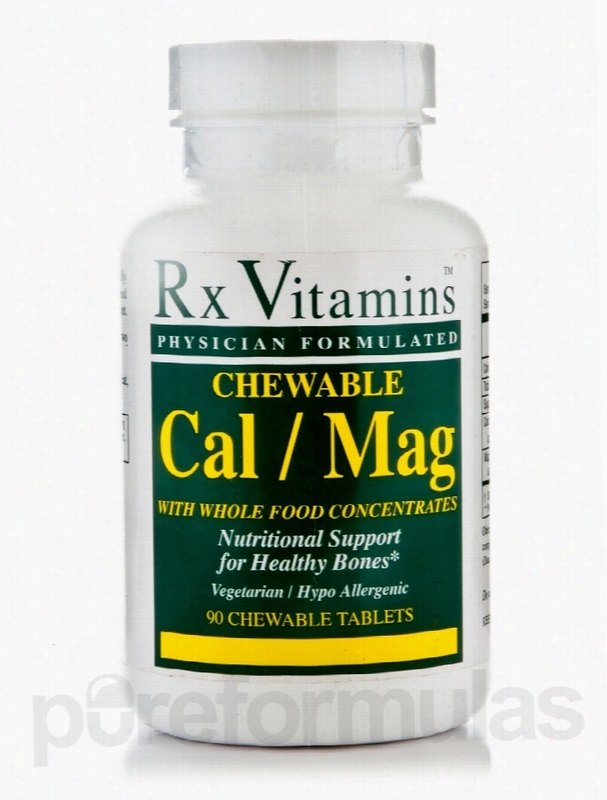 Rx Vitamins Cardiovascular Support - Chewable Cal / Mag - 90 Chewable. Your body needs essential vitamins and minerals in order to nourish&sbquo; maintain&sbquo; and protect itself. For example&sbquo; calcium is crucial for strong&sbquo; healthy bones&sbquo; skin&sbquo; and hair; it may also support cardiovascular health and alleviate kidney stones. In addition to bone strength&sbquo; calcium may also have the following health benefits: Lessening painful premenstrual syndrome (PMS) symptoms like cramps and high stress levels&sbquo; especially when combined with magnesium Support for colon&sbquo; breast&sbquo; and ovarian health Helping cardiac muscles contract and relax properly Protecting teeth from gum disease and tooth decay by keeping the jaw bone strong&sbquo; thus ensuring tight-fitting teeth where bacteria are less likely to thrive Magnesium is usually coupled with calcium for better absorption. It also supports heart and bone health&sbquo; while possibly decreasing anxiety&sbquo; headaches&sbquo; and muscle cramps. You can get calcium and magnesium through foods like nuts&sbquo; kale&sbquo; and sardines. However&sbquo; if you aren't able to maintain a balanced diet on a daily basis&sbquo; you may want to consider taking a supplement to ensure you receive the proper amount of calcium and magnesium. Chewable Cal/Mag by RX Vitamins can complement your dietary intake by providing the minerals you need to maintain a healthy lifestyle. The main ingredients in every chewable tablet are 250 mg of calcium and 50 mg of magnesium (50 mg). At the recommended dosage of two chewable tablets daily&sbquo; each 90-tablet bottle of RX Vitamins&rsquo; Chewable Cal/Mag should last you about a month-and-a-half. Since its founding&sbquo; RX Vitamins has been dedicated to producing state-of-the-art and innovative nutraceuticals specific to each health condition. Health care practitioners have come to know RX Vitamins as a producer of dependable&sbquo; high-quality&sbquo; effective Nutritional supplements available at reasonable prices; its products are often recommended to them by fellow clinicians. RX Vitamins has become well known as a trustworthy source of health-enhancing products that can be counted on to help both human and animal patients&sbquo; due to scientific research. These statements have not been evaluated by the Food and Drug Administration (FDA). These products are not meant to diagnoseÃ¢ÂÂ treat or cure any disease or medical condition. Please consult your doctor before starting any exercise or nutritional supplement program or before using these or any product during pregnancy or if you have a serious medical condition. 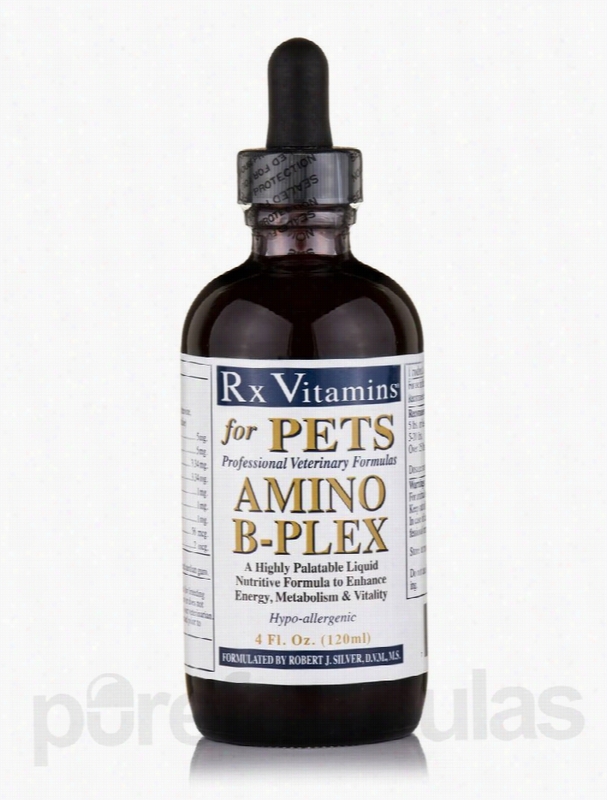 Rx Vitamins Dogs - Amino B-Plex for Pets - 4 fl. oz (120 ml). 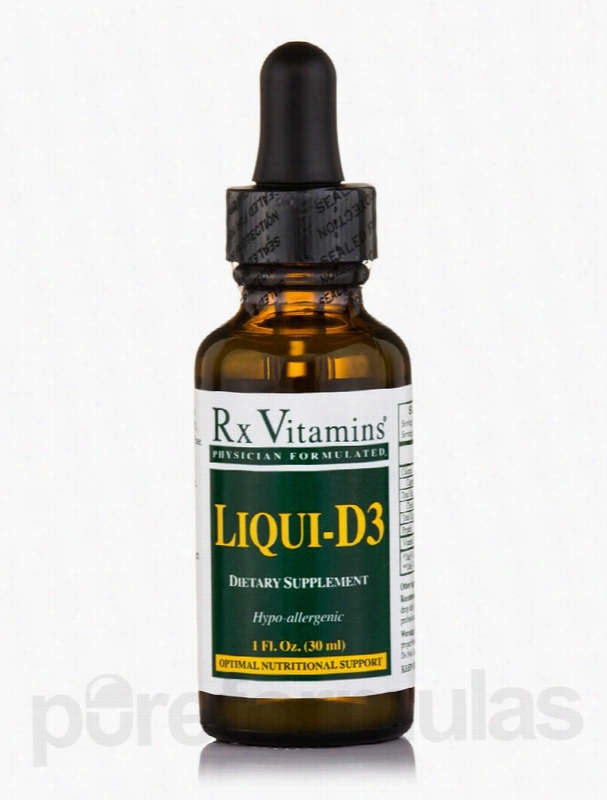 Rx Vitamins Joint Support - Liqui-D3 - 1 fl. oz (30 ml). Rx Vitamins Dogs - MegaFlex for Pets (Dogs & Cats) Powder - 21.16 oz. Rx Vitamins for Pets&rsquo; MegaFlex for Dogs &amp; Cats Powder provides several ingredients that may help your pet stay active by working to keep his or her joints healthy. For example&sbquo; one tablespoon of MegaFlex for Dogs &amp; Cats Powder contains 1&sbquo;000 milligrams of glucosamine sulfate. Notably&sbquo; glucosamine could potentially aid in building cartilage&sbquo; which is a form of connective tissue that cushions your pet&rsquo;s joints. This Rx Vitamins for Pets supplement also provides a form of sulfur called methylsulfonylmethane (MSM) that might work to slow down the nerve impulses that transmit pain signals. As a result&sbquo; this product may act to relieve minor pain or stiffness. Although dogs and cats of all sizes could potentially benefit from taking MegaFlex for Dogs &amp; Cats Powder&sbquo; this supplement may be particularly helpful for larger dog breeds that put more weight on their joints on a daily basis; markedly&sbquo; the recommended serving size for a 100-pound dog is just one tablespoon daily! 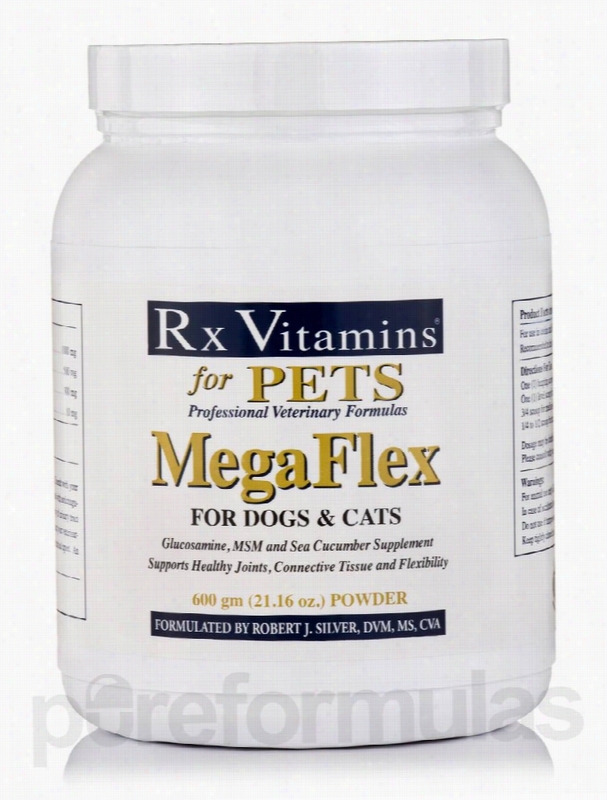 Each bottle of MegaFlex for Dogs &amp; Cats Powder by Rx Vitamins for Pets contains 600 grams of powder. These statements have not been evaluated by the Food and Drug Administration (FDA). These Products are not meant to diagnoseÃ¢ÂÂ treat or cure any disease or medical condition. Please consult your doctor before starting any exercise or nutritional supplement program or before using these or any product during pregnancy or if you have a serious medical condition. 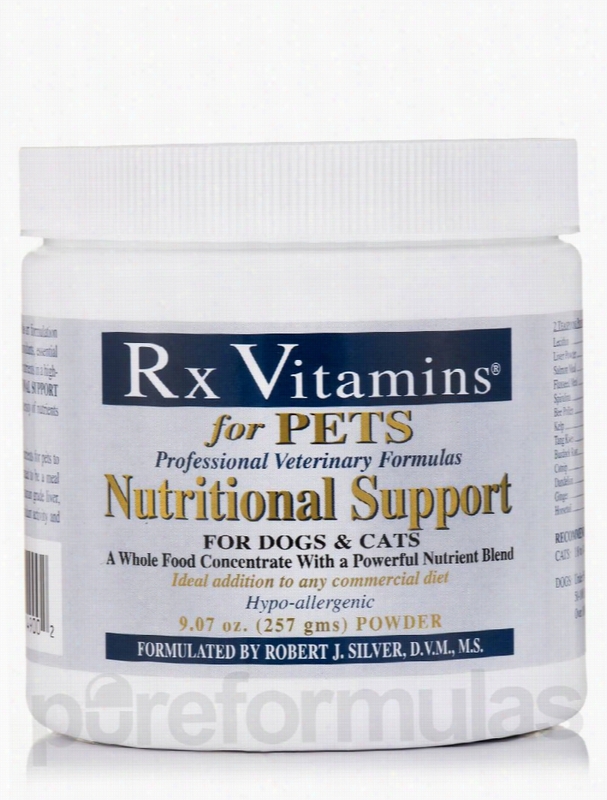 Rx Vitamins Dogs - Nutritional Support for Pets (Dogs & Cats) Powder -. A supplement like Nutritional Support for Dogs &amp; Cats Powder by Rx Vitamins for Pets could potentially help your pet stay healthy. First&sbquo; this powdered supplement provides several vitamins and minerals that may work to maintain overall well-being. For example&sbquo; vitamin E might play a role in regulating cardiovascular and immune function&sbquo; while biotin may act to preserve a healthy-looking skin and coat. In addition&sbquo; this Rx Vitamins for Pets supplement contains antioxidants like superoxide dismutase (SOD). As a result&sbquo; Nutritional Support for Dogs &amp; Cats Powder might work to protect your pet&rsquo;s cells from free radical damage. Finally&sbquo; every serving of Nutritional Support for Dogs &amp; Cats Powder provides a wide array of herbs. For instance&sbquo; horsetail extract could potentially work to alleviate mild incontinence as well as other symptoms associated with minor urinary tract infections. Each container of Rx Vitamins for Pets&rsquo; Nutritional Support for Dogs &amp; Cats Powder provides over nine ounces of powder&sbquo; which is easy to mix with the cat or dog food of your choice. These statements have not been evaluated by the Food and Drug Administration (FDA). These products are not meant to diagnoseÃ¢ÂÂ treat or cure any disease or medical condition. Please consult your doctor before starting any exercise or nutritional supplement program or before using these or any product during pregnancy or if you have a serious medical condition. 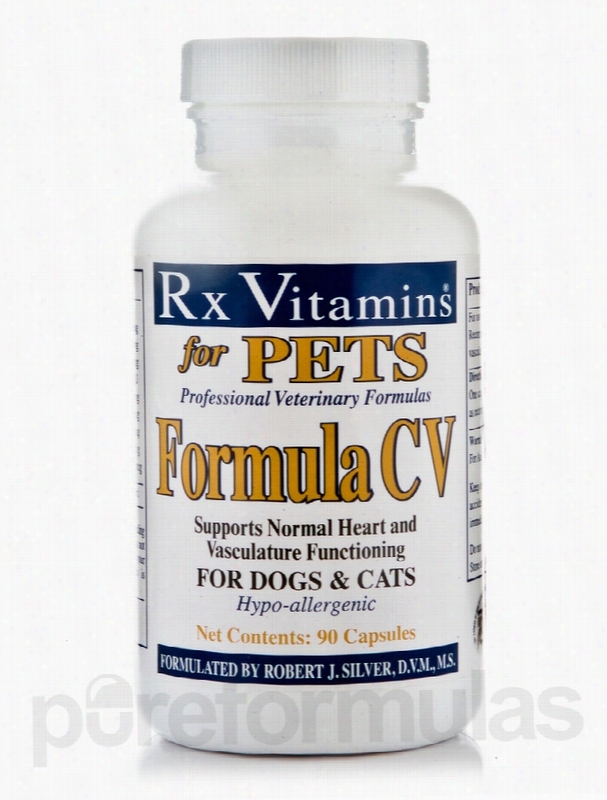 Rx Vitamins Dogs - Formula CV for Pets (Dogs & Cats) - 90 Capsules. 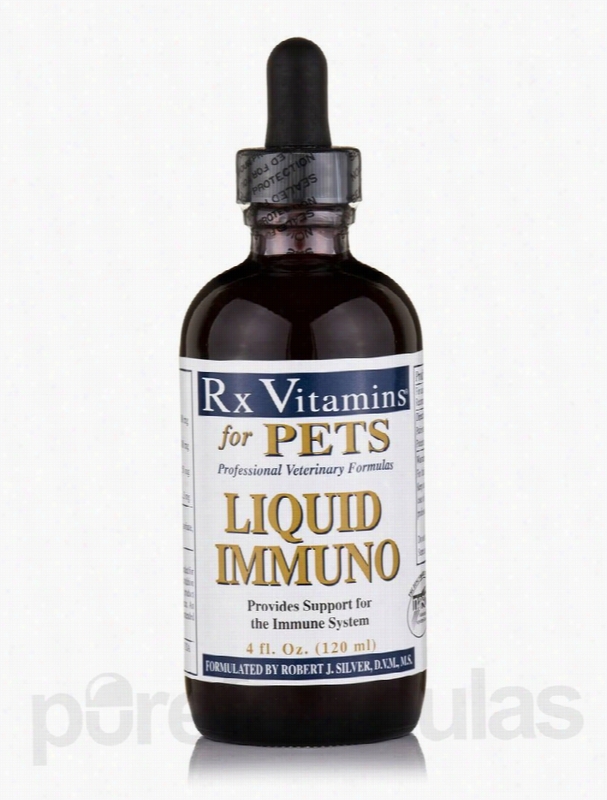 Rx Vitamins Dogs - Liquid Immuno for Pets Original Flavor - 4 fl. oz. Liquid Immuno (Original Flavor) by Rx Vitamins for Pets contains a blend of ingredients that may work to support your pet&rsquo;s immune system. First&sbquo; Liquid Immuno (Original Flavor) provides reishi mushroom extract. According to proponents of traditional Chinese medicine&sbquo; this mushroom may help address certain symptoms associated with mild upper respiratory infections. This Rx Vitamins for Pets supplement also contains an amino acid called L-lysine that might have a gentle anti-viral effect. Furthermore&sbquo; lutein is a bioflavonoid that may offer additional support for the functioning of your pet&rsquo;s immune system. Moreover&sbquo; the larch arabinogalactan in Liquid Immuno (Original Flavor) could potentially act to stimulate the activity of natural killer cells and macrophages&sbquo; both of which are white blood cells that may be involved in fighting off foreign bacteria and viruses. Finally&sbquo; this liquid supplement is easy to give to cats or small dogs who are unable to swallow pills. Each bottle of Rx Vitamins for Pets&rsquo; Liquid Immuno (Original Flavor) contains four fluid ounces of solution. These statements have not been evaluated by the Food and Drug Administration (FDA). These products are not meant to diagnoseÃ¢ÂÂ treat or cure any disease or medical condition. Please consult your doctor before starting any exercise or Nutritional supplement program or before using these or any product during pregnancy or if you have a serious medical condition.